So far, we’ve talked about using input sheets to simplify life, and drawing from those input sheets to come up with custom cables and snakes that make set up go faster. Sometimes you have a bunch of gear that needs to be placed on and removed from the stage every week. In those cases, I like to put it in a rack, box or other enclosure to make it go faster. Don’t let the word “custom” scare you off; these don’t have to be expensive or elaborate boxes. In fact, the most expensive box on this page was our drum box, and that cost us $30 in materials plus a few hours labor. The other racks we had lying around (and even if we bought them new, neither would be more than $200). When I say custom, what I really mean is that you’ve considered the needs, and tied it all together in a way that makes sense for you. Nothing that I’m showing you here is prescriptive; they are systems we’ve built to address needs we have. Your needs will be different, so act accordingly. Consider these ideas. Up until a few months ago, we used a Muse Receptor II running Ivory II for our digital piano. We have a Yamaha C7 baby grand on stage, and the C7 comes with a built-in MIDI controller. The piano plays and looks like a real piano, because it is. Going digital has made it sound better overall because we never have anything else in the piano “mic’s” because there are no mic’s—it’s all digital, all the time. Ivory II sounds great, and with some tweaking, our players have come to enjoy playing on it. At least they did until the Receptor stopped booting. I decided to replace it with a tricked out Mac Mini. I bought the $599 version, a 2.3 GHz Core i5, then loaded it up with a 240 GB 6G SSD from OWC, and 8 Gigs of RAM. It now boots from off into Ivory in 21 seconds. Not bad. For output, we use a Focusrite Saffire 24. As you can see, we have plenty of room in this rack. I’m using a 6-space rack because, well, that’s what we had lying around. Someday, I may order a 4-space and save some room. At the back of the rack, I’ve Velcroed a Radial ProD2 DI. Short 1/4” cables run from the Saffire to the DI, and we wired the output of the DI to the front for easy access. 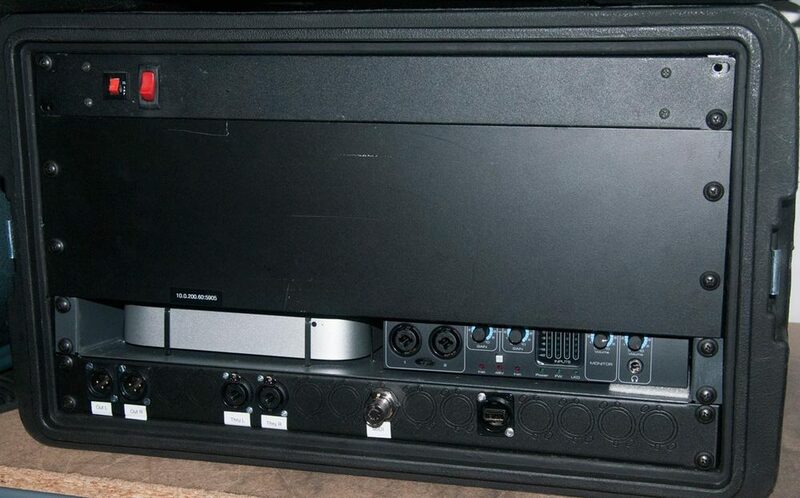 The Mac is strapped to a rack shelf with a series of crossed zip ties. I was going to use Velcro, but I didn’t want to muck up the bottom of the Mac. Some companies make special racks for Minis, but I don’t mind this (and I’m kinda cheap). I used Velcro to mount the Saffire, however. Below is our I/O panel. From the left, we have stereo line out, a set of combo jacks that come off the through ports on the DI, MIDI in and USB. We don’t normally need the USB, but once in a while we do have to do some maintenance on the Mac, so it’s easier to plug a keyboard and mouse in. We have a VGA cable out back for the monitor. The Mac is set to turn on after power loss, so when we turn on the power to the rack, it simply boots up into Ivory Standalone. We shut it down using a VNC client. The whole thing weighs under 10 pounds, so it’s easy to carry out to stage, and lock back up after the weekend is over. On the other side of the stage, we use this vertical rack on wheels for our IEMs. A PSM1000 and PSM900 are mounted herein (well, the 900 is out right now, sorting out an antenna issue), along with the S-4000D M-48 distro, and our input panel. If you remember our M-48 snakes I talked about last time, this is where they end up. The Ethercon plugs into the S-4000D, while the XLRs plug into the appropriate jacks on the input panel. The input panel simply routes down to the inputs of the PSMs. We also have a PowerCon In connector on the rack to make it easy to plug and unplug the whole system. We used to roll it on and off every week, but decided to leave it out. The PowerCon Out powers our drum box (see below). There’s nothing fancy here; it’s pretty utilitarian. At some point, we’re going to need to expand this as we will be adding more PSMs. When we do, I’ll probably just build a new one. I like the vertical orientation, as it is very easy to see everything when standing. However, it’s a bit of a mess, cabling-wise, so the new version will likely be horizontal with better cable management. And that’s what’s fun about custom rigs like this; I put this together out of found parts to fill a need. After we’ve used it for a while, the need becomes clearer and we’ll build v.2 to be even more of what we like. Someday we’ll come up with a better name for this, but for now, it's The Drum Box. The box is simply that; a box. We used to have this weird, ugly step-turned-sideways thing that supported the M-48, with a short stool next to it for the MacBook Pro we use for tracks and the click. I hated it, and decided to fix it. This is a v.2 product, so it’s designed to do exactly what we needed of it. The M-48 is mounted on a slide-out shelf for two reasons. First, it slides out for easy access by the musician; second, it slides in so we can lock it up. The top is sized to accommodate a 13-17” MacBook Pro, plus our Yamaha metronome. We drilled holes for MagSafe power and FireWire on the side, plus a right angle 1/4” and power on the top for the click. Below the M-48 is another Focusrite Saffire interface, and below that are two more Radial ProD2s. One D2 is for L&R tracks, the other is used for the clicks (track and metronome). We have both 4-channel and 6-channel Saffire's available, so if we ever want to do more than a stereo click, we have room to add DIs. It’s all pre-wired and power comes from the IEM rack. The light-colored groove you see around the front accepts a slide-in cover, that locks in place for security. The box also makes a nice place to hold spare felts and other drum hardware, a drum key and the occasional iPhone. We will probably add a cup-holder to the other side at some point. And, as you can see, we also have a com unit there for communication with FOH. None of these units are particularly fancy, but each one saves us a lot of time each week. We used to spend several minutes dragging out DIs, interfaces and the M-48 for the drum riser. Now, we open the box, set the laptop on top, bring out the click and we’re done. The Ivory rig takes 30 seconds to cable and power up, and the IEM rack just is. Individually, these aren’t deal-makers; but combined with the other steps in our process, they help make an efficient set up go even quicker. Next time, we’ll cover the final installment, baseline show files.